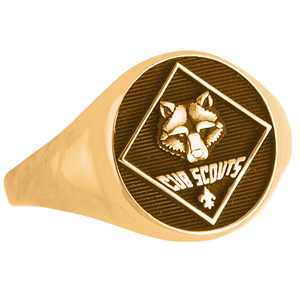 This Cub Scouts signet ring features a round logo top and antique finish. Engrave the inside of the ring with name or message. Plain smooth shanks. Top dimensions: 12mm x 12mm. This ring is officially licensed by the Boy Scouts of America. Handcrafted to order. Made in the USA.